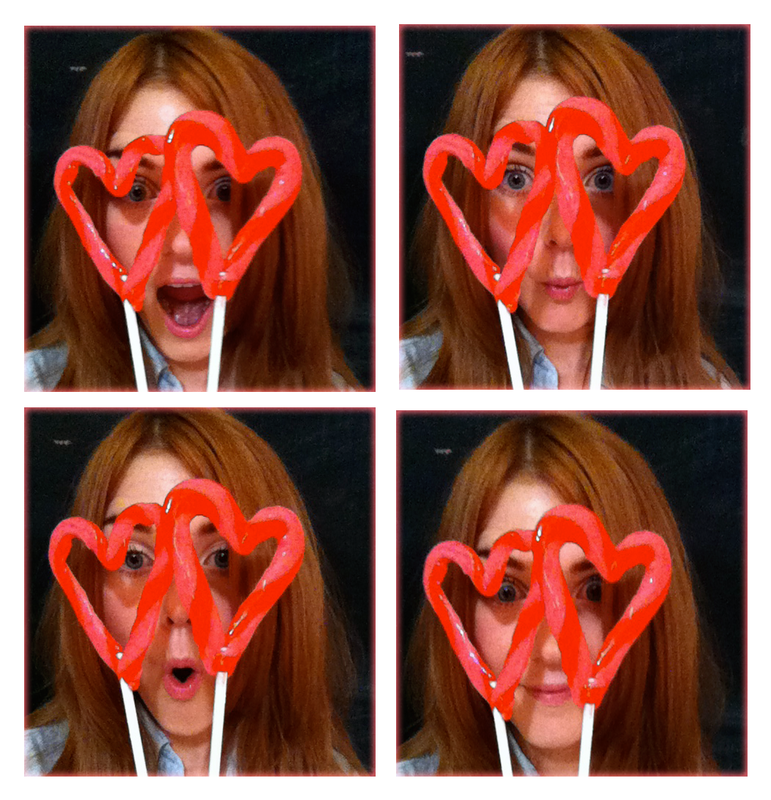 The Salty Girl: heart-shaped candy cane pops! 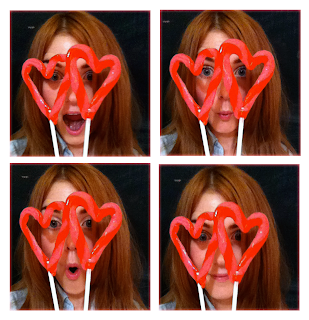 The Salty Girl believes that everything is better when it's heart shaped and on a lollipop stick! Especially candy canes. These homemade candy cane heart pops are adorable. Just look at them! They make great presents for coworkers, kids, or even as gift toppers! Candy making is serious business. If you aren't careful, you'll burn the hell out of your thumb. I'm speaking from experience. You have to really pay attention to a candy thermometer. I burnt two batches of sugar before I made these! I was trying to multitask and I failed. I've read that this is a great project for kids, but I really don't know anything about kids. I have a dog. All I'll say is that you heat the sugar to 300 degrees before pouring it. I wouldn't want my dog around that, myself. However, Disney even offers classes to teach kids how to make candy canes, so it must be safe, right? 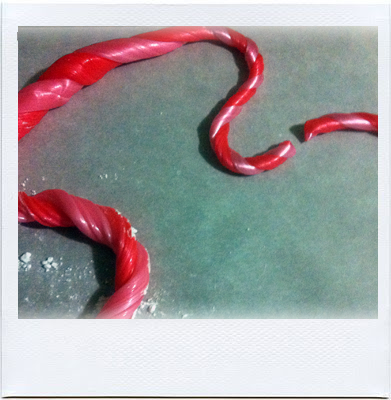 You can make candy canes in any color, shape, or flavor. It's up to you! I meant to do red & white, but I touched the white candy with my pink gloves, and voila, pink and red candy. Happy accident I guess. 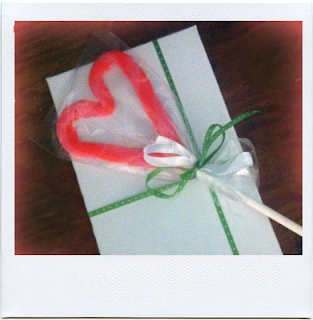 These heart shaped candy canes would look really cute for Valentine's Day, too! Or maybe you could do clover shaped for Saint Patrick's Day! That would be something!!! latex gloves, and a pair of knit gloves underneath them if you have them. I didn't, and it was really hot. Preheat your oven to 250 degrees. Spray or grease your pans. Boil sugar, corn syrup, and water in a small saucepan, stirring until sugar dissolves. Once the sugar has dissolved, do not stir it anymore or you risk ruining your candy. Cook the sugar mix until it hits 305 degrees on a candy thermometer. 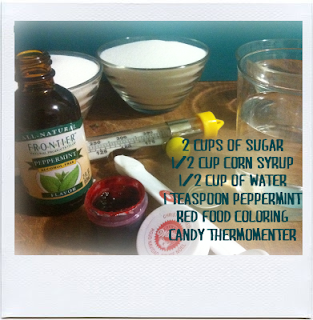 Stir in the peppermint, and pour 2/3rd of the mixture in one pan, and 1/3 of the mixture into another pan. Add your red food coloring to the smaller mixture. Coat a metal spatula with cooking spray, and fold the edges of the candy over on itself until it's cool enough to handle. Robed in your rubber gloves, pull candy out to about 1 foot, and then fold it in half and repeat. (Here's an indepth article candy pulling if you don't quite understand what I mean.) After a minute or two of pulling, the clear batch of candy will start to turn white. When it's almost cool, shape it into a small log, about 5 inches long. Do the same for the red candy, except pull it into ropes double the size of the white log. Press the red ropes into the white log. Working quickly, twist and pull from the end of the candy. 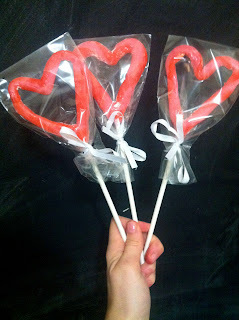 Cut it with oiled scissors when it's long enough to form your candy heart, about 6 inches. Roll the round so that it's even all the way around, and then shape into a heart. Take your lollipop sticks and press them into the candy. If your candy starts to harden in this process, you can heat it up again by putting it into the oven for 2 minutes. 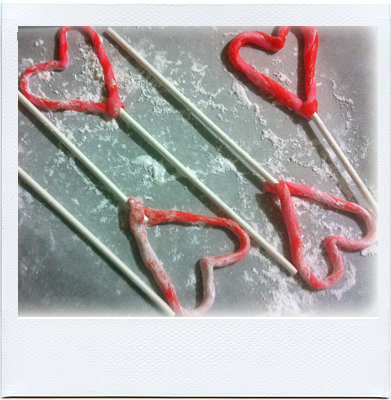 After all of your hearts are formed, place the hearts on a baking sheet lined with parchment paper and put them in the oven for just a minute or two to make sure that the lollipop sticks are solid in the hearts. Transfer hearts to a baking sheet to harden. I put down powdered sugar because I read that was a great way to cure the candy canes, but I don't recommend it - it ruins the sheen of the candy. Keep a close eye on it though so it doesn't melt! When you have your heart shaped candy canes, Just lay them on an oiled baking sheet. Let the candy hearts rest for 24 hours or they will stick to your teeth when you eat them! Give them to everyone you know!